Photo courtesy of Abe Borker. It’s sunset on the French Frigate Shoals, located 500 miles northwest of Honolulu. Some two hundred thousand nesting seabirds form a cacophonic ensemble as the last of daylight fades away. 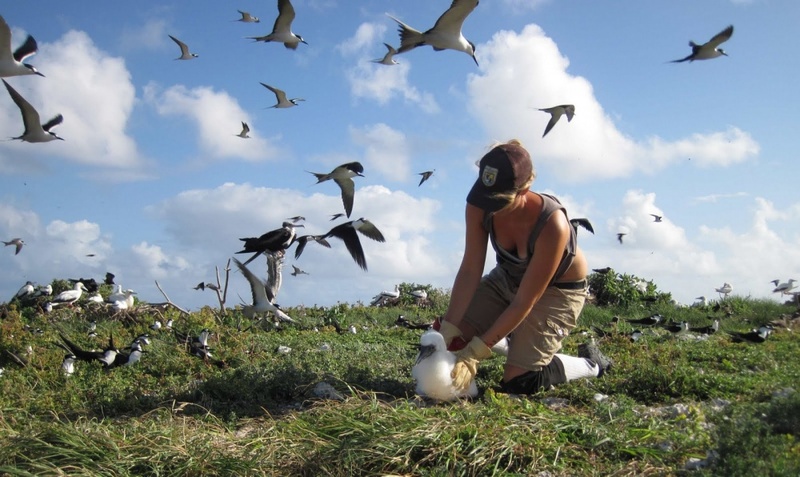 Researchers would love to tune into the trumpeting squawks of Black-Footed albatross and guttural croaks of Brown Noddies to monitor the size and health of these populations. Now, they can do so without the huge expense of being there in person, thanks to Google Android smartphones. A network of phones, spread across remote islands, will upload bird sounds from the field and beam them to scientists back in their labs, via satellite. 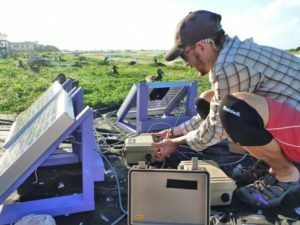 The phones are part of a newly released system called Wireless Acoustic Monitoring (WAM), developed at UC Santa Cruz by Coastal Conservation Action Laboratory (CCAL) in conjunction with Los Angeles non-profit company Nexleaf Analytics. The joint collaboration acknowledges funding from National Science Foundation (NSF), with $380,000 awarded to date. According to a new review by Birdlife International, 28% of the world’s 346 seabird species are globally threatened and 17 of the 22 albatross species at risk of extinction. Seabirds sit at the top of the food chain. Their decline is an indicator of a deteriorating marine ecosystem. Aquaculture, fish farming, invasive species, and climate change lower the chance for many species to make a successful comeback. But these worrying statistics are also due to virtually unknown conservation status for many seabird species. “In the past, these trends have been at such a scale that we couldn’t monitor our outcomes fast enough,” said CCAL seabird biologist Abe Borker. In an effort to prevent future seabird extinctions, CCAL now seeks to improve monitoring methods. The UCSC research group teams up with BirdLife International, a partnership of 114 national conservation organizations, to deploy WAM systems at important bird areas (IBAs) throughout the Pacific Ocean. “With the new systems, it’s a very tangible goal to measure what exactly is going on with seabirds,” continued Borker. Last August, CCAL and Nexleaf held a successful trial run of the smartphones at Southeast Farallon Island (SEFI), part of Farallones National Marine Sanctuary, 26 miles offshore of San Francisco. Seabird population at SEFI is over 350,000. It’s known to be a legendary migrant trap, says Borker, where under the right conditions, waves of rare Pacific pelagics will breed there before returning to life at sea. 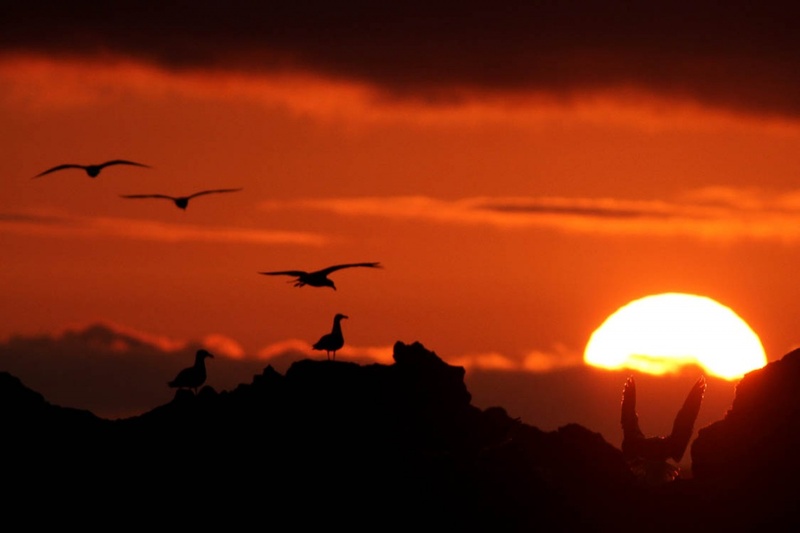 “Getting around the Farallones would be pretty easy if it weren’t for the hundred thousand birds nesting on the ground,” Borker said. Some of island’s feathered inhabitants nest free from observation, high up in rocky cliffs, while others nest on the ground in colonies so dense that it’s near impossible for a researcher to walk through. In the early 1990s, CCAL co-founded Island Conservation Society, non-governmental organization based out of Santa Cruz. Over the decades, CCAL found island biologists needed a better way to shuttle boatloads of sound data. Then they met Nexleaf. Nexleaf, a small analytics company backed by UCLA research enterprise, Center for Embedded and Networked Sensing (CENS), began to develop SoundProof. It is the mobile phone tool that transforms the everyday pocket device into a scientific instrument that collects and uploads data. The group’s ultrasensitive radio system can withstand harsh weather conditions inside its weatherized and solar-powered box. It seamlessly connects to an external microphone and pre-amplifier, with each device sampling over roughly a hectare—that’s about the same area as an international-size soccer field. Now the group is in process of groundtruthing, or calibrating, their technology at SEFI, based on the locations where researchers already work. Matthew McKown, CCAL research associate and one of four co-principle investigators of the project, says traditional monitors have been used at the Farallones for many years. “If we put them in all the same locations, then we can use side-by-side comparisons to better our own metrics,” said McKown. Acoustics, while still in their infancy, have played a long history in bird monitoring. In the early 1980s, famous ornithologist Ted Parker once noted seven scientists surveying biodiversity in a small patch of Bolivian rainforest. It took them 54 days in the field and 36,000 hours of total work. In just one week Parker used a tape recorder to detect 85% of those same species. A decade later, Cornell University’s Lab of Ornithology, also known as Lab-O, began using autonomous recording units (ARUs). Then in 2003, Wildlife Acoustics went commercial with SongMeter SM2, capable of both underwater and terrestrial recordings. Drawing parallels with today’s modern field of communications, the race has since escalated to make acoustics a more sought-after conservation tool. A research group at University of Wisconsin recently developed WeBIRD, an iPhone app coming soon is based loosely on popular music-identifying apps, Shazam and MusicID. Just this month, Lab-O debuted the BirdLog app for iPhone and Android, which logs birdcalls into a highly organized online library. But there’s no bigger a player than CCAL and Nexleaf’s WAM technology, which helps make the technological leap in conservation to combine mobile devices that take dictation with server-side systems that can extract meaning of collected sound exposures. “From our standpoint, we are increasing our power to detect seabird trends over time,” said McKown. Regarding WAM’s competitive pricing and upload efficiency, he says, “We are charging forward with it. However, it has not all been smooth sailing for the group. Last August’s trial run helped reveal a technological clunk they recently tackled. Lukac noticed that since WAMs were solar-powered, they had to function during periods of low sunlight or if the system was stuck in thick marine fog. He designed the digital finger. Lukac connects the phone to a microcontroller and a transistor to switch electronic signals. The digital finger allows the user to remotely press the power button. But CCAL faces another hurdle. It is disruptive to think of nature-loving scientists cooped up in the lab. Using sound analysis programs, biologists spend months processing sound data coming in from distant islands. So, CCAL tries another formula. “We are now writing fully automated algorithms to classify a birdcall that the computer can’t recognize,” said Borker, who has become as much a computer programmer as he is a seabird expert. By automating this program, he said scientists could teach their computer to screen through periods of silence and trigger for localized events. What are the beginnings of wireless monitoring and automated data collection is now in practice back at the French Frigate Shoals on Tern Island. In January, CCAL introduced the island’s research group, sponsored by United States Fish and Wildlife Service (USFWS), to their new sensors. 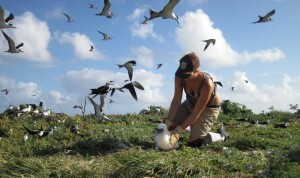 Biologist Sarah Youngren and two other researchers monitor the seabird wintering grounds from December to the early summer months, as part of the USFWS Nesting Seabird Monitoring Study. Ratio of biologist to bird is sometimes as high as 1 to 100,000 so they were perfect candidates to start using the sensors. Youngren and fellow USFWS colleagues help protect Tristam’s Storm Petrel and many species of Albatross. Birdlife lists Tristam’s as “near-threatened”, because the human-introduced kiore, an invasive rodent, destroys the nests of sand-dwelling seabirds. While monitoring, the team takes extra care as not to crush a mother’s nest. McKown said Tern Island uses WiFi-enabled multimedia as data collecting instruments. They not only use smartphones, but also camera traps, video feeds, and weather stations to better understand bird populations. Using multimedia networks, scientists could potentially capture more moments of intimacy with seabirds, which may have otherwise gone undocumented. Last month, McKown recently visited Upper Limahuli Preserve, north of Napoli Coast on Kaua’i Island, where CCAL and Kaua’i Endangered Seabird Recovery Project (KESRP) are developing a wireless network to help protect the Hawaiian Petrel, Newell’s Shearwater, and many other bird species. It is here that McKown envisions a helicopter blanketing Kaua’i’s diverse habitat with thousands of WAM sensors. CCAL now focuses on grant funding to improve how they store their data virtually in the “cloud” for collaborators across the globe to access. The challenge of how to handle huge amounts of audio and video data online has long haunted conservationists working from distant islands. The cloud, Mckown said, has solved that problem. CCAL and Nexleaf are in their third year of collaboration. Their next WAM deployment is scheduled for late April at the Farallones. Another seabird breeding season is just around the corner.